Pivotal and Mirantis recently announced a partnership whereby Pivotal will support deployments of Pivotal Cloud Foundry on the Mirantis OpenStack platform. Meanwhile, Mirantis will resell Pivotal Cloud Foundry to its IaaS customers. The partnership between Pivotal and Mirantis reinforces the integration between OpenStack and Cloud Foundry by bringing together two leading open source technologies in the cloud computing space and delivering a full stack marked by infrastructure provisioning and management capabilities in addition to agile application development functionality. As noted in a Pivotal blog post, customers can deploy Pivotal Cloud Foundry on Mirantis OpenStack by following a runbook that streamlines its deployment. The collaboration between Pivotal and Cloud Foundry underscores the ascendancy of open source cloud computing technologies that are predicated upon transparent governance frameworks and the contributions of developers and organizations from all over the world. By offering Pivotal Cloud Foundry on top of Mirantis OpenStack, Pivotal and Mirantis render available an on demand solution that absolves companies of the hassle of integrating an application development platform into an infrastructure deployment. The partnership gives Mirantis the feather in its cap constituted by an enterprise-grade PaaS in the form of Pivotal Cloud Foundry. Correspondingly, Pivotal benefits from the increased sales channel exposure enabled by access to Mirantis customers. The real winner from this partnership, however, is OpenStack insofar as it continues to cement its reputation for having the ability to integrate with major PaaS, database and Big Data technologies as recently exemplified by the agreement between Oracle regarding its Database as a Service and Mirantis, and Piston Cloud’s announcement of Piston OS 4.0. Now generally available, Pivotal Web Services with Enterprise support manages an AWS instance on behalf of the customer, thereby absolving customers of the challenge of managing the AWS environment as it scales and morphs in relation to the demands of application and data ingestion. 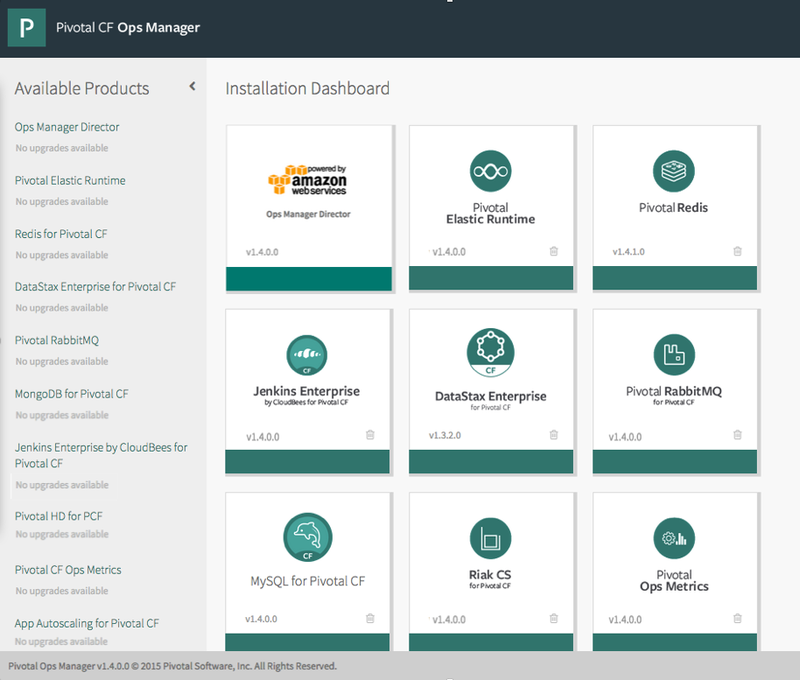 With the latest Pivotal Cloud Foundry release, Pivotal becomes the first major middleware vendor to include managed public cloud capacity in a software subscription at no additional cost. By offering hosted public cloud along with dedicated self-install on either public or private clouds, Pivotal Cloud Foundry provides the instant-on affordable capacity Line of Business (LOB) executives need with the robust security and automation features IT can also bring to private clouds. With today’s release, LOB and IT can finally agree on a single platform. Here, Watters notes how Pivotal includes support for Amazon Web Services in a Cloud Foundry subscription at no additional cost. Moreover, by supporting a private cloud, Watters remarks on how Pivotal delivers enhanced operational agility to Line of Business teams that may have an interest in leveraging a public cloud for development purposes in advance of the decision to transport their applications back to the on premise environments specific to their organization. All told, Pivotal’s support of Amazon Web Services for its Cloud Foundry distribution aptly exemplifies the quintessence of Pivotal’s mission of enhancing enterprise agile application development by means of cutting edge technologies at the nexus of cloud computing and application development. In addition, Pivotal’s support of AWS for Pivotal Cloud Foundry dramatically enhances the potential for Cloud Foundry-based application portability and moves the needle of cloud native application development toward enhanced interoperability and the adoption of open standards for contemporary computing. Pivotal Big Data Suite is a major milestone in the path to making big data truly accessible to the enterprise. By sharing Pivotal HD, HAWQ, Greenplum Database and GemFire capabilities with the open source community, we are contributing to the market as a whole the necessary components to build solutions that make up a next generation data infrastructure. Releasing these technologies as open source projects will only help accelerate adoption and innovation for our customers. Pivotal’s announcement of the open sourcing of its Big Data suite comes in tandem with a strategic alliance aimed at synergistically maximizing the competencies of both companies to deliver best-in-class Hadoop capabilities for the enterprise. The partnership with Hortonworks includes product roadmap alignment, integration and the implementation of a unified vision with respect to leveraging the power of Apache Hadoop to facilitate the capability to derive actionable business intelligence on a scale rarely performed within the contemporary enterprise. In conjunction with the collaboration with Hortonworks, Pivotal revealed its participation in the Open Data Platform, an organization dedicated toward promoting the use of Big Data technologies centered around Apache Hadoop whose Platinum members include GE, Hortonworks, IBM, Infosys, Pivotal and SAS. The Open Data Platform intends to ensure components of the Hadoop ecosystem such as Apache Storm, Apache Spark and Hadoop-analytics applications integrate with and optimally support one another. All told, Pivotal’s decision to open source its Big Data suite represents a huge coup for the Big Data analytics community at large insofar as organizations now have access to some of the most sophisticated Hadoop-analytics tools in the industry at no charge. More striking, however, is the significance of Pivotal’s alignment with Hortonworks, which stands to tilt the balance of the struggle for Hadoop market share toward Hortonworks and away from competitors Cloudera and MapR, at least for the time being. Thus far, Cloudera has enjoyed notable traction in the financial services sector and within the enterprise more generally, but the enriched analytics available to the Hortonworks Data Platform by means of the partnership with Pivotal promise to render Hortonworks a more attractive solution, particularly for analytics-intensive use cases and scenarios. Regardless, Pivotal’s strategic evolution as represented by its open source move, its collaboration with Hortonworks and leadership position in the Open Data Platform constitute a seismic moment in Big Data history wherein the big data world shakes as the world’s most sophisticated big data analytics firm qua Pivotal unites with Hortonworks, the company responsible for the first publicly traded Hadoop distribution. The obvious question now is how Cloudera and MapR will respond to the Open Data Platform and the extent to which Pivotal’s partnership with Hadoop distributions remains exclusive to, or focused around Hortonworks in the near future.